We are going to synchronize google-calendars(Personal, Work) with evolution calendars (Personal, Work) respectively.For shake of simplicity we took similar name for these calendars. One can choose any arbitrary peer name. 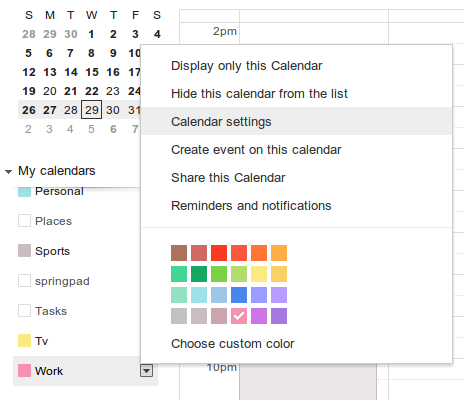 Synchronization between work calendars is shown here. First add a google account with Ubuntu-Online-Account (UOA) OR Gnome-Online-Account (GOA). The username would be like uoa:ACCOUNT_ID,SERVICE_NAME OR goa:YOURUSERNAME@gmail.com for UOA & GOA respectively. If there are multiple accounts with same username (for example: Google & Jabber), acccount-id is used. For eaxample: ag-tool list-services 9. It will show service type & corresponding SERVICE_NAME. Then one can form username in the required format (i.e uoa:ACCOUNT_ID,SERVICE_NAME). The default SERVICE_NAME for google calendar is google-calendar. This username is required in Step1 (For New Methods). Syncevolution in Ubuntu <=13.10 (from official repo) is NOT compiled with Ubuntu-Online-Account. For UOA, One must compiled syncevolution from source with uoa enabled.For Ubuntu >=14.04 users must install syncevolution-provider-uoa to make it work with Ubuntu-Online-Accounts. Replace ACCOUNT_ID with your own <ACCOUNT_ID> number. If there are multiple accounts of same username it will fail but print account-id in terminal. Next time use that account-id to select a specific google-account. Caution: Old method uses plain authentication which was meant to be disabled by Google & may not work properly. To check whether all configuration is working properly one can print all items in local or remote databse. For the first-time sync it is strongly recommended to use -- sync refresh-from-remote or --sync slow option during the sync to avoid duplicity. Caution: "refresh-from-client" option WILL DELETE EVERYTHING IN EVOLUTION CALENDAR (for caldav/carddav client is remote server & server is local client i.e. syncevolution) AND REPLACE WITH GOOGLE-CALENDAR. This will start two-way sync which is the default sync-option defined in step 5. One can go back to original state if anything goes wrong during the sync. SyncEvolution automatically creates backup for each sync-session & saves as logdir(log directory) to '~/.cache/syncevolution. What we need here is the session directory path which is /home/$USERNAME/.cache/syncevolution/gcal-2013-05-30-19-45 (last sync session) from the above example. On can restore either after or before the sync for each sync-session except the last. Remove --dry-run option option to write data to evolution-data-server. However it is recommended to pass --dry-run option (before running without it) to view all calendar events that are going to be restored. To view all command-line options go to syncevolution-usage wiki page.